As we could see all around us, dark bees, probably of the Carniolan race, were coming and going. Some were entering the middle hive, with the Carniolans, and others were going into the third hive, the other Italians. When we checked the Carniolans in early October, we could see the entire top box filled with capped honey, and so we didn’t look too deep. “They would be fine,” we thought. “So much honey they gotta make it through the winter.” From our initial glance, it seemed like the other Italian hive had died, and the Carniolans coming and going were robbing the other Italian hive of its left over honey. Terrance and I cracked the Carniolans open. A couple of living bees, but primarily just a top box filled with honey. We went down a level. Half-filled frames of honey abounded, but no nest or cluster of bees, just the odd stragglers. At the bottom, there was nothing. No dead bees, no dead cluster, no dead anything. Literally an empty hive filled with honey. There is absolutely nothing to report. 130 lbs of honey and no bees. Those few stragglers were from a neighbor’s hive, presumably, come to rob this empty hive. In the other Italian hive, a similar situation appeared, just not so much honey left-over. There were a lot of dead bees on the screen at the bottom, but upon closer examination they must have been from the summer, or even from the bottom of the package when we introduced them because they were nearly decomposed. A mouse had moved in beneath the carcasses under the bottom board. I did find a few Varroa mites on the bottom board, but no signs of infestation. There was no dead cluster of bees, no sign of supersedure, just an empty hive with some honey. Ironically, these bees were observed in the top box when I fed them in January, so some time in the last month they just disappeared. Please, someday enjoy bees over tea. So I hope you will entertain the idea that Michael and Kelle’s bees in the Greenlake neighborhood of Seattle were calling me. It is not so far-fetched an idea as it might seem. Somewhere in my library of bee-books there are stories of medieval practices in the event of the death of a beekeeper. Some European cultures felt the bees had to be notified of the death of their keeper, and the new one had to ask the bees to take kindly to him, otherwise they would be aggressive or grow weak and die. Another story I remember is the hive had to be moved just an inch or two in the event of a beekeeper’s death so the bees would be made aware of the shift coming to their lives. But perhaps the best advice that illustrates the connection between a beekeeper and his or her charges is the frequent reporting to bees of major events like war or marriages, as well as anything that may be on the mind of the beekeeper. I like this last bit of advice. I don’t talk to my bees, but I don’t keep any secrets from them either. This one particular hive residing at Michael and Kelle’s has beautiful bees in them: incredibly gentle, industrious, and prolific. 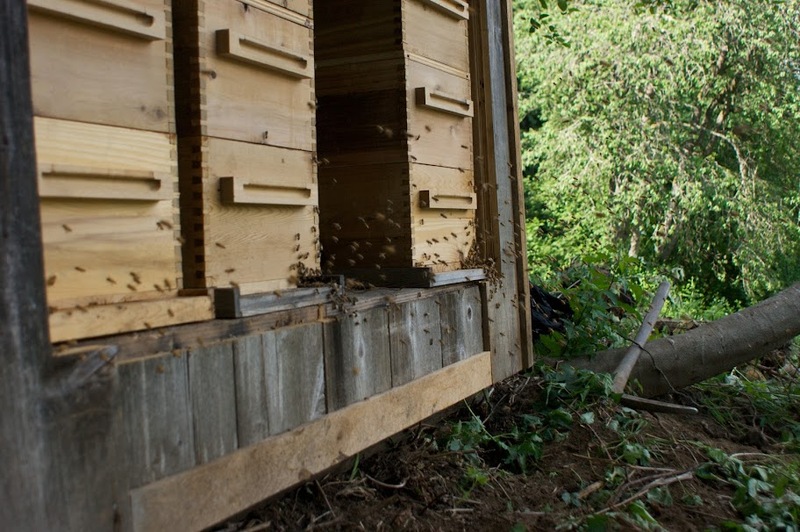 They are so industrious and prolific, that by mid-June of last year they were working on drawing the comb and storing honey in their third box, after only two months of residency. They also decided to swarm. After quite an adventure and with Kelle’s help, we caught them and put them in a new hive. I gave them a few frames of honey and one of pollen from their old hive, and set them on their way to building their new home. I could have fed them sugar syrup to provide the many necessary calories it takes to build out a new hive, but it wasn’t even summer yet and I assumed with the honey I gave them they would be alright. By mid-September they had drawn out a second hive body, but about 40% of the honey was uncapped, which I feared might ferment in our wet winters. Additionally, it was clear that their behavior had shifted and they were remaining closer to the center of the colony with the young brood for the winter. I assumed the uncapped honey was going to remain that way. So I knew going into this winter that starvation was a threat for them. The past couple nights before going to bed I had a worried feeling in my gut, and in my mind I kept seeing bees searching around an empty hive for food as my thoughts made their transition to the stuff of dreams. Finally today I could bear it no longer and headed over to feed them. Michael and I made sugar-water, and since we heated it on the stove I wanted to give it time to cool before giving it to them. It was taking a while so I suggested we have tea and go outside. We sat in the tea house catching up on news looking out upon the hives in the rain. Gradually the rain subsided and the sky lightened up enough to cast diffuse rays of sunlight upon the hives, and the first few bees emerged. Our conversation turned to deeper questions of life as one hive awoke sending dozens of foragers out looking for spring, and the other, the one I was worried about, gradually did the same on a much smaller scale. In the top box of the weaker hive, there were bees milling about, but no evidence of honey in surplus. I didn’t pull out any frames, as it was a little too cold, especially for such a weakened colony, but if there was any honey in there, it was scant. I placed the inner-cover over the frames, then the feeder tray, then the jars of sugar syrup, a hive body around that and then the lid, leaving them with many wishes for a tolerable winter and early flowers, as well as many thanks for the privilege and pleasure of watching them over tea.